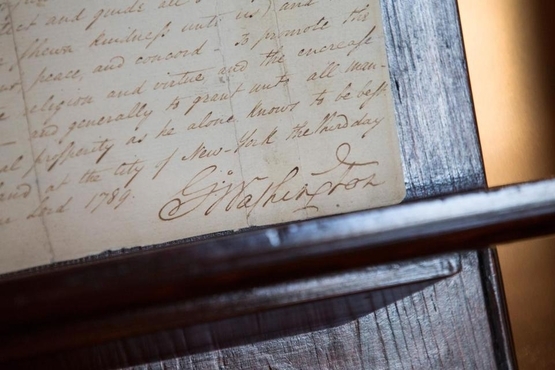 George Washington's signature on the orginal Thanksgiving proclamation, dated October 3, 1789. AS AMERICANS GATHER around the holiday table this week, no one is likely to be concerned about the legitimacy of our most cherished national holiday, or about the president's yearly Thanksgiving Day proclamation. Yet in the early years under the Constitution, Thanksgiving fueled a lively debate that touched on two core elements of American liberty: the division of power between the federal and state governments, and the separation of church and state. Melanie Kirkpatrick, a veteran journalist now based at the Hudson Institute, recounts the controversy in her wonderfully engaging new book, Thanksgiving: The Holiday at the Heart of the American Experience. The issued flared up when the first Congress, having worked for six extraordinarily productive months to implement the new Constitution and create a national government from scratch, was preparing to recess. On September 25, 1789, Representative Elias Boudinot of New Jersey proposed that a congressional delegation be sent to President George Washington to request "that he ... recommend to the people of the United States a day of public thanksgiving and prayer to be observed by acknowledging, with grateful hearts, the many signal favors of Almighty God." The resolution emphasized in particular that Americans should give thanks for the "opportunity peaceably to establish a Constitution of government for their safety and happiness." But Boudinot's motion drew immediate fire. Thomas Tudor Tucker of South Carolina raised an objection based on that very Constitution. "Why should the President direct the people do what, perhaps, they have no mind to do?" he demanded. Maybe Americans felt grateful and maybe they didn't, but either way it wasn't for Congress to get involved. "If a day of thanksgiving must take place, let it be done by the authority of the several States," he said. That wasn't Tucker's only concern. However laudable it might be to give thanks to God, he pointed out, "it is a religious matter, and as such is proscribed to us." Just one day earlier, Congress had approved the wording of a proposed Bill of Rights — including what would later be known as the First Amendment — and, as Kirkpatrick notes, "the debate about the proper role of religion was fresh in everyone's mind." Thomas Jefferson declined to issue a Thanksgiving proclamation on the grounds that the Constitution gave the president "no authority to direct the religious exercises of his constituents." In the end, Boudinot's motion passed. The resolution was delivered to Washington, who in turn issued the first presidential Thanksgiving proclamation a few days later. He designated Thursday, Nov. 26, 1789 as a day for Americans to render "sincere and humble thanks" to God "for the great degree of tranquility, union, and plenty which we have ... enjoyed" and "for the civil and religious liberty with which we are blessed." In broad, nondenominational language he expressed the hope that Americans might "unite in most humbly offering our prayers and supplications to the great Lord and Ruler of Nations," and that he in turn might bless every nation on earth "with good governments, peace, and concord." Washington's proclamation set the tone for future Thanksgiving proclamations. But concerns about church-state separation, and about the constitutionality of presidents designating a national day of prayer and thanksgiving, persisted. They especially troubled Thomas Jefferson. As governor of Virginia during the Revolution he hadn't hesitated to proclaim a day of "solemn thanksgiving and prayer to Almighty God," but as the third president a quarter-century later, he declined to do so. 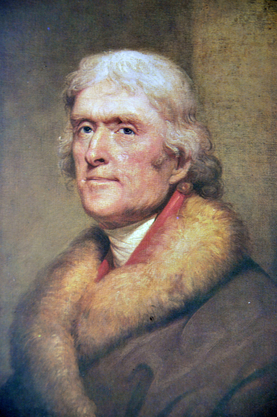 "The government of the United States [is] interdicted by the Constitution from intermeddling with religious institutions, their doctrines, discipline, or exercises," Jefferson wrote to a clergyman who had urged him to promulgate a Thanksgiving holiday. He conceded that he was deviating from "the practice of my predecessors." But this was a matter of conscience, he explained, "& mine tells me that civil powers alone have been given to the President ... and no authority to direct the religious exercises of his constituents." Jefferson's qualms didn't stand the test of time. The First Amendment has never been held to forbid presidents from mentioning God or encouraging gratitude and prayer. Every president since Abraham Lincoln — whether Episcopalian or Methodist, Catholic or Quaker, Baptist or Unitarian — has issued a yearly proclamation expressing thanks for the nation's blessings and liberty. Thanksgiving became a beloved religious holiday that isn't bound by any religion. As even Jefferson might acknowledge were he alive today, nothing could be more quintessentially American.